DLI Past President, James E. Patterson. James E. Patterson, 1988-1989 DLI President and owner of Your Valet Fine Drycleaning in Logan, Utah, passed away January 4 in Ogden, Utah. He was 85 years old. Patterson graduated from High School in Marietta, Ohio, in 1950 and joined the United States Air Force, where he studied at the Russian Language School in Syracuse, New York. He served as a Russian language interpreter during the Korean War at bases in Anchorage, Alaska and Adak Island. Patterson married in 1956 after his tour of duty was complete. He completed a Bachelor’s degree in Geology at the University of Colorado and worked for two years with Pan-American Petroleum in Wyoming. In 1961 he and his wife, Suzy, opened Your Valet Fine Dry Cleaning in Roy, Utah. The company started with one location and grew to include 10 stores with more than 100 employees over a 53-year period. 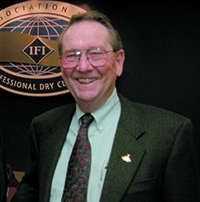 The Pattersons were active industry volunteers, and Jim served on DLI’s (then the International Fabricare Institute) Board of Directors from 1988-1989. Though Institute presidential terms last one year, a board member must serve four years to attain that rank and serve another year after as Chairman. This includes being voted into the Treasurer and President-Elect offices. Patterson was also very involved in local activities, serving as President of the Roy Chamber of Commerce, Chair of the Military Affairs Committee of the Ogden Chamber of Commerce, and was the first civilian sent to the USAF War College. He also volunteered on the Youth Impact Board of Directors for 17 years and was a member of the Ogden Exchange Club. He enjoyed golfing and involvement in the R & W Club. Jim is survived by his wife Suzy of 61 years, his daughter Alice and son-in-law Gary Moe, granddaughter GraceAnne of Park City, Utah. Donations in Jim Patterson’s name may be made to Youth Impact, 2305 Grant Avenue, Ogden, Utah 8441 or online at www.youthimpactogden.org.